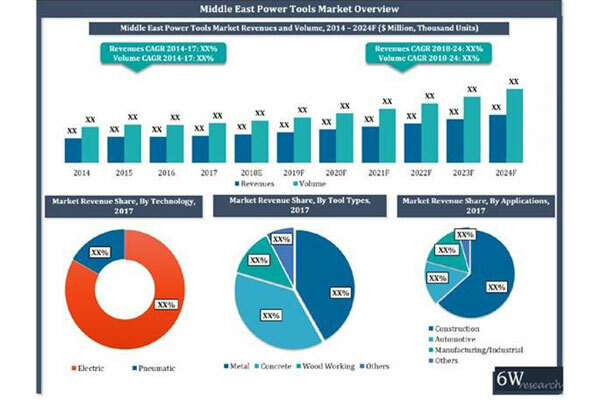 The Middle East power tools market is projected to grow at a compound annual growth rate (CAGR) of 9.0 per cent during 2018 to 2024, according to a recent report by 6Wresearch, a global market research and consulting firm. The Middle East power tools market witnessed a steady growth during 2014-17 led by buoyant construction activities primarily in UAE and expansion of manufacturing and industrial sectors, said the report. The report, titled "Middle East power Tools Market (2018-2024)", estimates and forecast the overall Middle East power tools market by technology types, verticals, tools types and countries. Oil crisis led to slowdown in the construction activities across several key markets across Middle East region primarily Saudi Arabia. Additionally, Turkey which is one of key contributors to the power tools market in the Middle East had witnessed political and economic instabilities, it added. With stabilisation of oil prices, government spending is expected to firm up and construction market is likely to regain momentum. Additionally, major global events such as World Expo 2020 in Dubai and Qatar World Cup 2020 are expected to stimulate the growth in the region leading to increased demand for power tools. Additionally, rapid expansion of manufacturing and automotive sectors would further fuel the growth of power tool market, said the report. “This was primarily due to strong demand for cordless power tools and high adoption rates in construction vertical,” he said. “During the forecast period, pneumatic power tool segment which currently occupies a low share of the power tool market is expected to register a healthy growth, driven by expansion of manufacturing and automotive hubs across the region,” he added. “Though, the vertical suffered a setback owing to slump in oil prices and sharp spending cuts, however, it still managed to secure the top spot amongst the other verticals,” he said. “During the forecast period, ambitious infrastructure projects in Turkey, UAE and Qatar would possibly keep construction vertical a key contributing region for power tools market vendors. However, verticals such as manufacturing and automotive are expected to expand at a faster pace as compared to construction vertical offering significant opportunities for power tool market vendors,” he added.